Stralsund and Wismar are two historic coastal cities in north-eastern Germany, that owe WHS status because of their role in the Hanseatic League (13th to 15th centuries) and their Swedish heritage (17th and 18th centuries). 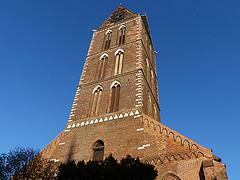 Both towns are rich in gothic religious architecture, sharing six major 'Gothic Brick' churches between them. They also feature unaltered medieval ground plans, and city centres that survived World War II almost unscathed. This site is considered so closely related and complementary to the Hanseatic City of Lübeck WHS, that ICOMOS recommended turning them into a serial nomination. Both Stralsund and Wismar can be visited on a day trip from any of northern Germany's big cities. I choose the more remote Stralsund, located about 200 km east of Lübeck. It's an easy Autobahn-ride deep into Mecklenburg-Vorpommern and close to the German-Polish border where controls were lifted earlier this week. How the world changes. Stralsund itself used to be hidden behind the Iron Curtain too. Anno 2007 it turns out to be a pretty and well-looked-after little town. Parking and navigation is easy in the almost deserted streets. Ugly modern construction that so dominates Lübeck fortunately is lacking here. The Hanseatic and the Swedish heritage go side-by-side, brick houses and colourful residences alternate in the streets. Most impressive sights are the red brick churches adorned with huge towers. One of these former churches now houses the 'Meeresmuseum', a museum dedicated to the sea with bits and pieces of GDR history and an aquarium. Fun for kids and a bit quirky too. The Stralsund harbour is where the locals are taking their Sunday stroll. I finish my stay here at a fish restaurant with lunch of jacked potato and caviar. Hundreds of years after the Hanseatic League lost its influence, both Stralsund and Wismar became major administrative and defence centres when they were ruled by the Swedish kingdom in the 17th and 18th centuries. The need for protection means both city centres stayed relatively small and concentrated. That’s great for visitors because it’s easy to walk between the main sights and explore most significant buildings within a day. Even if there wasn’t the history and the medieval architecture, Stralsund and Wismar are interesting cities to visit. The influences of the Baltic coast means there’s a recreational feel lots of great seafood and bars on offer. I buy a pickled herring sandwich from a man in Wismar who is serving them right off a boat in the harbour. You can see the main sights of either in less than a day but an overnight stay is a great way to experience a bit more and enjoy the calmer evenings when the tourist buses leave and the sunset drinks start getting poured. In Stralsund, I got a strong impression when I walked along the city wall of Knieperwall how big is Stralsund. There are also two beautiful gates; Kutertor and Kniepertor. 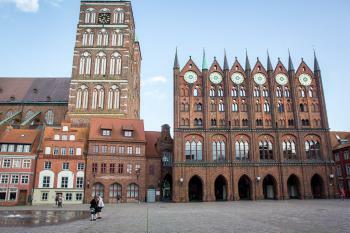 The most beautiful building of Stralsund is Rathaus because of an architectural language. That identified as the Gothic of the region of Sund. This city has a lots of Swedish influence especially colors and style at houses. Building restoration is still under process in the historic center of Stralsund. The lookout from the tower of St Marien church is so beautiful ! Wismar is much smaller than Stralsund. The Bridge House, canal Grube, Furstenhof, St Mary's Church, Alter Schwede and Wasserkunst are my favorite attractions of Wismar. 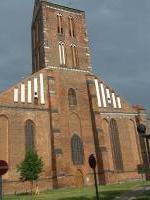 St Mary's Church is a landmark of Wismar because of the 80 metre high tower. The Furstenhof is the earliest important Renaissance structure in Mecklenburg. 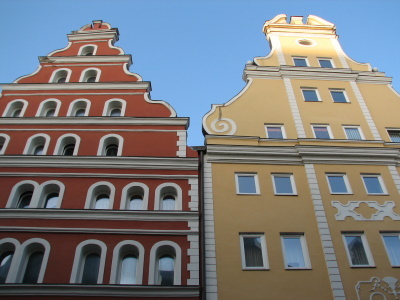 Stralsund and Wismar have both own World Heritage Information Center. The entrance to these center is free! I visited this WHS in October 2014. Unfortunately I only had time to visit Wismar as I wanted to visit nearby Schwerin and also go birdwatching since hundreds of grey cranes were arriving after migration. I spent a whole day wandering around the narrow streets of Wismar, admiring the gable houses next to the red brick houses. The market square and the Wasserkunst is worth visiting as is the Bridge House and the harbour area. The main highlights of Wismar are the 3 gothic red brick churches: St Nicholas Church (worth visiting inside to view the beautiful genealogical tree fresco and the intricate triptych dating from 1430), St George's Church and St. Mary's Church (only the tower is left). Having viewed 3 out of the 6 churches I think I can safely say that I could grasp the OUV of this WHS. If ever I will have the chance to visit Stralsund, further north in Mecklenburg Vorpommern, I'll happily visit. Otherwise, I'll treasure the wonderful day I spent in Wismar. Well I will give those Baltic Red-Brick Gothic architects’ one thing: they can certainly build a massive church. That was the main thing that struck me after my visit to Wismar on New Year’s Eve 2012/13. My exploration took me through the affluent looking shopping streets from the heaving bulk of one massive church onto the next, and wandering through the giant remnants of St Marien Kirche. It was rather impressive. I can’t say I was particularly taken by the main square, much like Frederik my main impression was one of a giant car park surrounded by a few nice buildings. On my way towards the old Harbour I stopped into the Heiligengeistkirche as residents were arriving for Mass. I was really impressed by the painted ceiling and also thankful of somewhere to warm up. As it was New Years eve I spent a lot of my time jumping at the sound of fireworks exploding next to me, but also covered an inordinate amount of miles trying to find an open restaurant or bar, they were all reserved for private parties later in the night, but after 20 or so establishments, I managed to have a pizza down by the waterfront (In case you are wondering I’m not exaggerating, even the Irish Pub was closed! ), however the harbour side was a rather charming place to while away some time before heading off to my train. After visiting Wismar and Stralsund as well as Lubeck this year, I am pleased that Lubeck is a separate WHS. Probably as a result of having been hidden in East Germany for several decades these two towns have retained their integrity as heritage towns. Very little modern construction is apparent, in fact some WWII bomb damage is yet to be restored, eg the Marienkirche in Wismar). Saw both towns in a day, travelling by train between. 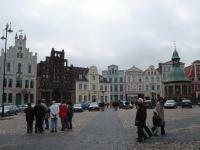 Wismar is a small town on the Baltic coast in northern Germany which has rich heritage of Hanseatic League and Sweden. Wismar can be called a prettiest small city in northern Germany; it's full of many lovely buildings from hanseatic brick style to Swedish gable houses. Its pride is large red brick cathedral of St. Nikolai which every decorative detail made from bricks, a very unique way in this region. The city's market square is very nice with lovely renovated building and in the centre of the square is a big well covered with Dutch Renaissance style pavilion called Wasserkunst! The seafront area is also nice with lively old buildings and fish market. The big problem of Wismar is cars, they park everywhere from main square to small streets which sometime ruins the atmosphere. Waking in Wismar is a very nice experience; all pavements are very good in design for walking, every turns always have some surprise with amazing buildings, churches, squares and my favorite is a bridge decorated with pigs! Wismar is just great for spending your time in holiday, less crowned compared to Stralsund or Lubeck and has the feel of down to earth. Swedish link is still active in this city; I can see Swedish flags more than German ones. You may wonder where you are now, Sweden or Germany. 2.0: Stanislaw Warwas Peter Loov Ian Cade Don Irwin Clyde Peter A. Once named after Stalin: L?bsche Stra?e , the main street of Wismar , was called "Stalinstra?e"
Religious sites connected to fishermen: Wismar's St. Nicholas Church was once the church of the fishermen, sailors and travelers. Cultural sites taking up an entire island: Stralsund: "Unique in Stralsund is the island location, unchanged since the 13th century, between the Strelasund and the ponds on the land side, which were dammed soon after the town was founded." Recommended for combination by AB: With Lübeck: "ICOMOS further recommends that consideration be given to the possibility of inscribing the historic towns of Stralsund and Wismar as a serial nomination together with Lübeck. 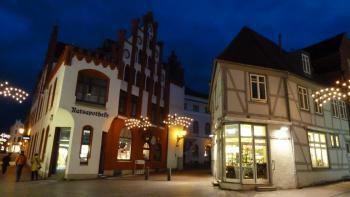 All three towns were leading centres in the Wendish region of the Hanseatic League in northern Germany"